You will find this unique holiday home nestled against the deeply wooded surroundings of Plateau des Milles Etangs (Thousand Lakes) . A little higher up is a small, quiet village with views over the lovely, green hills. Being a little higher up gives it a feeling of space and freedom, yet you have all the advantages of being in a tranquil village. The surroundings, with its lakes and woods, are ideal for walking or cycling. 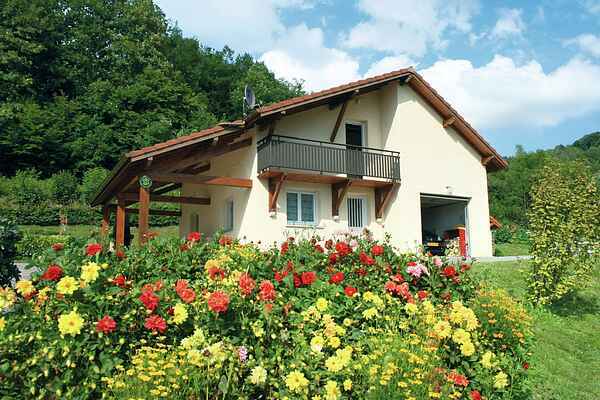 You can rent mountain bikes at Le Thillot (8 km). For swimming you can opt for the lovely Bassin de Campagney (30 km) or Etang de Malsaucy (34 km); both have a beach for you to enjoy and where you can relax. There is a bakery and greengrocer in Le Haut-du-Them (1 km) and a supermarket, restaurant and covered swimming pool in Le Thillot. You can also take the opportunity to spoil yourself at the spa in Luxeuil-les-Bains (34 km). The striking Chapelle Notre-Dame of Le Corbustier in the former mining town of Ronchamp (27 km) should also not be missed. If you charge the battery of your electric bicycle then electricity costs will be charged.